Did you know you can now order your Deliveroo takeaway from Da Corradi here on View? Do you work at Da Corradi? What did you think of Da Corradi? Da Corradi is a lovely restaurant. They serve truly authentic Italian food with real Mediterranean panache! This is a family run place with delicious food and a great wine list. Don't walk past Da Corradi - go in! Round the corner from Mayfair’s Curzon cinema, this unassuming Italian is very proud to have had many a famous face through its doors. On first inspection, you wouldn’t imagine this little Italian bistro to have much of a following. It occupies a backstreet in Mayfair’s Shepherd’s Market off the beaten track – a fitting setting that suits its traditional style – and is a tiny, two-floor venue compared to some of the big, bold and brash eateries in the area. 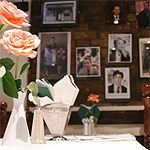 Yet a wall covered with signed photos attests to the fact that names such as Michelle Williams, Kevin Spacey, Al Pacino and Julie Andrews have set foot in Da Corradi, probably for some pre- or post-premiere grub with the Curzon round the corner. The rest of the two storey setup is fairly unremarkable, with a rose on each table, Roman sculptures and statuettes about the place and flower baskets and metallic patio chairs out front. The downstairs dining room has a rustic tavern feel to it, with low ceilings, exposed brick and white table cloths. This is a family-run bistro that sticks to the traditional. If you’re looking for a little slice of Italia in London then this is a good place to go. It’s especially geared up for couples as the tiny space is best suited to tables for two. Diners are predominantly older and of a spread of nationalities. Service is fairly swift, although there’s not much on offer in the way of small talk – enquire about those famous photos and you may just get a curt response. Meat dishes, pasta, pizza and specials are about as traditional as they come, but you’ll probably be quite satisfied with the rich and fairly authentic fare when it arrives at the table. There’s no faulting pasta dishes – fresh-tasting and cooked consistently and classically al dente. Penne all’arrabbiata (£9.75) is every bit as ‘angry’ as you’d hope, with an intense chilli heat that builds with every bite and the addition of a few salty capers making for a nice variation on the dish. And if it’s the classics you’re after, lasagne della casa (£10.10) certainly won’t disappoint. It bubbles underneath the surface and looks crisp around its edges; proof it’s been shown a good time in the oven. It’s pleasing to see so many diners opting for meat dishes rather than choosing from the stone-baked pizza menu – even if the melanzane e peperoni pizza (£9.65) sounds so tempting. That’s because there is an excellent range of veal dishes for true connoisseurs of Italian cuisine to feast on, including saltimbocca alla Romana (£15.95) – veal topped with Parma ham. Sticking to the family formula, torta della Nonna (£5.20) is a shortcrust pastry pine nut tart, just like Nonna would have made. And tiramisu (£5.40) is unsurprisingly present on the menu. But the dessert list throws up a few anomalies in an otherwise consistently traditional Italian restaurant, with apple pie (£5.35), Mississippi mud pie (£5.20) and even a banana split (£5.50) being prime examples. It’s all about the wine at Da Corradi. It’s not the most inspiring list, but you’ll be sure to find an Italian wine to suit the table. The Sicilian Sangiovese at £15.50 a bottle is a fruity, deep wine that will match both rich Italian food and lighter dishes on the menu. Half bottles will please the more reserved couples, with a choice between a Valpolicella, Chianti and Barolo. For a bit of variety, Italian beers are available by the bottle for £3.50, too.